Ty Kinslow, Headmaster of Southland Academy, has the distinct pleasure to announce that George A. Wall, son of Mr. and Mrs. Chris Wall of Americus, and Alec M. Tan, son of Mr. and Mrs. Albert Tan of Americus, have each received the Letter of Commendation for outstanding performance on the Preliminary SAT/National Merit Scholarship Qualifying Test in 2017. The National Merit® Scholarship Program is an academic competition for recognition and scholarships that began in 1955. High school students enter the National Merit Program by taking the Preliminary SAT/National Merit Scholarship Qualifying Test (PSAT/NMSQT®)—which serves as an initial screen of approximately 1.6 million entrants each year—and by meeting published program entry and participation requirements. Of the 1.6 million entrants, some 50,000 with the highest PSAT/NMSQT®Selection Index scores qualify for recognition in the National Merit® Scholarship Program. In September, these high scorers are notified through their schools that they have qualified for an elite honor. “The young men and women being named Commended Students have demonstrated outstanding potential for academic success,” commented a spokesperson for NMSC. “These students represent a valuable national resource; recognizing their accomplishments, as well as the key role their schools play in their academic development, is vital to the advancement of educational excellence in our nation. 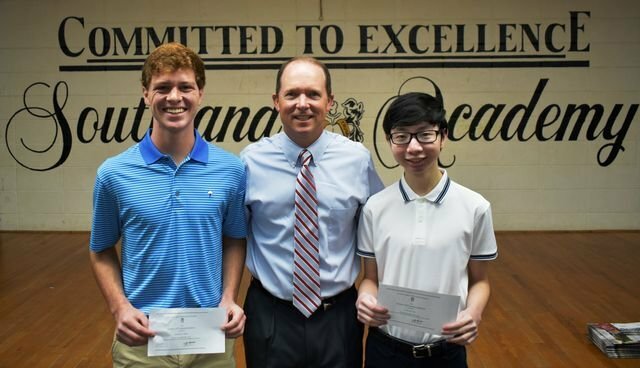 We hope that this recognition will help broaden their educational opportunities and encourage them as they continue their pursuit of academic success.” Both George Wall and Alec Tan are among the top 3% of all the students in the country who took the PSAT in 2017 to receive this special recognition. The Southland Academy administration, faculty and staff congratulate Alec and George as well as their families for this outstanding academic achievement.